The Silent Age iPhone, iPod Touch, and iPad app is an interactive comic book with an intriguing story driven by your gesture controls. The bold graphics, suspense-filled story, and apocalyptic soundtrack create an unusual, fascinating, and intriguing experience. The Silent Age iPhone app’s story is told from the perspective of an average man–Joe–who has worked essential, but uninspiring jobs like a window washer and janitor. He is promoted to a new position where he gains access to high-security clearance areas. Joe meets an injured man who, as he is taking his final breaths, tells him that something horrible will unfold. He gives Joe a tool to travel time where Joe learns life as he knows it will end in forty years. You help Joe unravel the truth to save the world. The Silent Age requires headphones and takes place in chapters. The first chapter and a brief synopsis fills the home screen. Just below the graphic, you can press help to access the gesture controls. One tap makes Joe walk. Two taps make him run. You may be asked to retrieve items for Joe, so you swipe the screen to see available items. You tap an item to place it in your arsenal of tools, and, if you need to use a tool you tap it from the list of items at the bottom of the screen and tap the screen where it must be used. 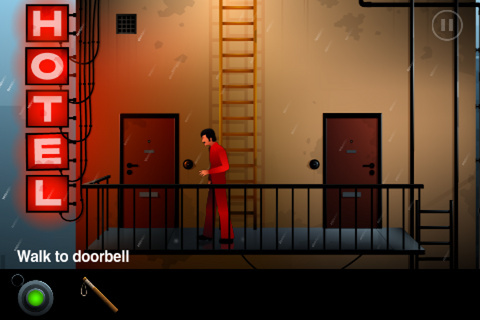 The Silent Age chapter begins, and the ominous music creates a dark, foreboding atmosphere. The graphics are static, stark, and bold. The story unfolds, as you tap the screen to make Joe move through his environment. When you reach items that drive the story, dialogue and text pops up at the top of the screen to give you clues and help you make decisions for Joe. The pace is slow and methodical. The interaction and gesture controls are uncomplicated, so the standout feature is this entertaining mystery. The Silent Age iPhone, iPod Touch, and iPad app is a free universal download from the iTunes App Store. It is smart, engaging, and addictive. 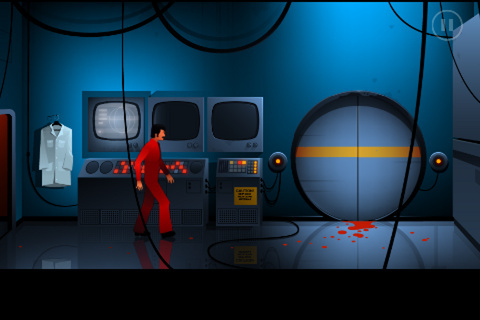 AppSafari review of The Silent Age was written by Jenni Ward on March 12th, 2013 and categorized under Adventure, App Store, Free, Games, iPad apps, Puzzler, Universal. Page viewed 4294 times, 3 so far today. Need help on using these apps? Please read the Help Page.